Clarkson ahead of Saints clash Alastair Clarkson spoke to the media today ahead of the side's clash with the Saints on Sunday. Jaeger O'Meara has had an electric start to the season. There is no positive way of spinning the loss of your reigning Brownlow Medallist in a training mishap in January. Nor does it help when a premiership pair almost simultaneously injure their hamstrings in Round 2. But Hawthorn Coach Alastair Clarkson has always promoted the notion of replacing a soldier with another soldier. When asked on Friday to evaluate an in-form Jaeger O’Meara’s start to the season, Clarkson instead opted to once again heap praise on the collective. “We’ve been pleased with all of our guys,” Clarkson said. “At the end of the day, they are just magnets on the board and so often you look at the opposition magnets and they look more powerful and experienced. The opening three weeks has seen promising signs from almost everyone that has rotated through the Hawthorn midfield. O’Meara is in career-best form, Ricky Henderson has emerged as a key ball-winner, while a group of youngsters have also put their hand up in the face of the challenge put before them. 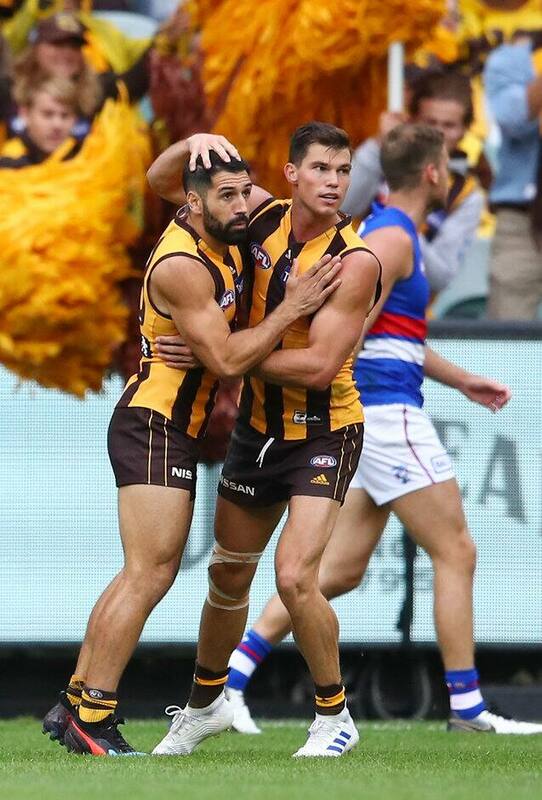 Hawthorn’s on-ball brigade is standing up at a time when many tipped its downfall. “It’s a hard midfield to break into with Jaeger playing well and Hendo as well. Clarkson predicted the midfield battle on Sunday against St Kilda would be central to how the game is decided. “Our midfield is going to have its work cut out this week. “That’s probably what the significant strength of the St Kilda side is, the depth of their midfield.